"...the leader takes center stage for a set of the finest piano tunes you'll ever hear!" "Jack" Ryan, honky tonk pianist, plays rugged and rollicking barrelhouse blues piano, singing vocals that make you feel as close to the Mississippi Delta as you can get. Travel with Jack playing the hard hitting blues of the South, as the honky tonk man takes you up river to the hot nightlife of Chicago. 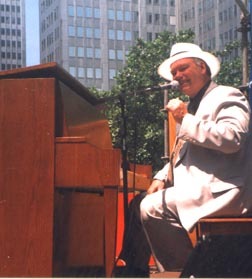 Presented in 45 minute to 1 hour sets leading up to a firecracker ending that will have your audience rising to their feet, Jack performes as a solo or by arrangement with his New Orleans Riverside Band.